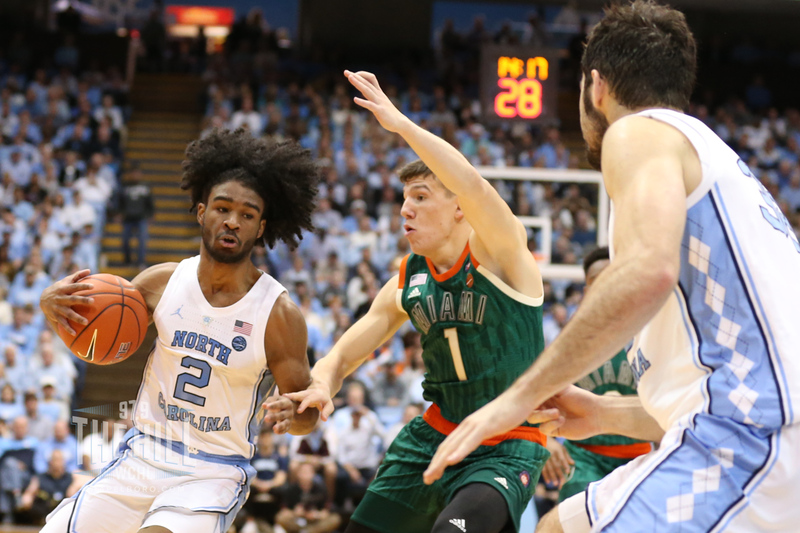 The ACC announced Monday afternoon that UNC senior forward Luke Maye has been named the league’s Player of the Week, while Tar Heel point guard Coby White is the conference Freshman of the Week. A 15-member media panel is responsible for determining the award winners. The Tar Heels defeated NC State last Tuesday in impressive fashion, then rallied to defeat Miami in overtime on Saturday–with Maye and White playing huge roles in both games. Maye had 31 points and 12 rebounds against the Wolfpack and added 20 points against the Hurricanes, including a game-tying three-pointer that sent the game into overtime. White, meanwhile, had 21 points and four assists in Tuesday’s win before exploding for 33 points and six assists on Saturday. He became the first UNC freshman to ever score 33 points twice in a season, while also hitting five of his seven three-pointers in the last seven minutes of regulation during Saturday’s comeback win over Miami. This is Maye’s first ACC Player of the Week honor this season and White’s third time as the league’s Freshman of the Week.